Happy Thursday! This is the "I'm learning new things!" edition of It's OK Thursday. 1. It's okay that I'm expanding my mind and bettering myself. This week, I learned all about the Hatfields and the McCoys. I consider it kind of a travesty that I didn't know anything about them before. Especially since the feud occurred only a couple hundred miles from my home. All I have to say is, holy freakin' cow, did these people know how to hate on each other. And I thought I was bad when it came to holding grudges. 2. 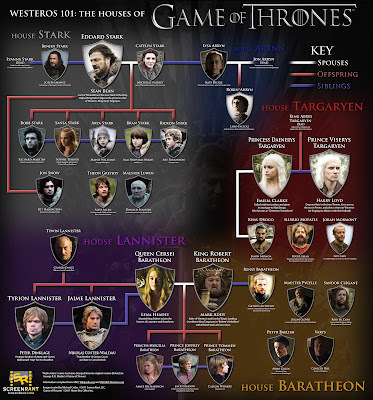 Also, it's okay that I feel like my mind has been expanded and knowledge has been poured in after finally straightening out who's who on Game of Thrones. You practically need a college course in family trees to understand one this messed up. The chart helps. 3. It's okay that I took the leap this past weekend and hopped on the Twitter bandwagon. 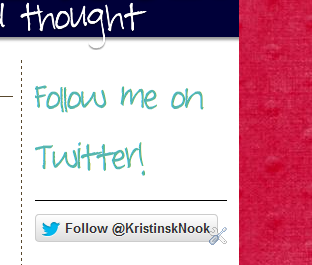 You can follow me by clicking on this thingy in the right hand corner. Truthfully, I joined on up because I want more of a way to stay connected with fellow bloggers and a way to stay disconnected from some of the real people around. Twitter tips are welcomed! What works for you? What doesn't? Any secrets? 4. It's completely okay that I hide people on Facebook. ALL. the time. Also, we can't forget Thankful Thursday at The Ramblings of Mrs. Hargraves! I'm simply thankful that I successfully made it through another week. Another week of working out, cleaning the house, eating lots of sugar, and distracting myself. I'm thankful that I have the time and opportunity to dabble in whatever I feeling like dabbling in this summer. I may despise this place (Alaska, if you're a new reader), but I'm a lot better off than most. I'm super thankful that Dorothy from Crazy for Crust asked me to do a guest post for her since she is on vacation. Check it out if you want to see how I put two of my favorite treats together: Brownies + milkshakes= the cakeshake. When I realized thatI had never heard of the Hatfeilds and the McCoys, I was so disappointed in myself. I have this weird obsession with all things Appalachia and I feel like i should have known! I am also thankful you posted on Dorothy's blog today! How else would I have found you and that awesome shake? I sure wish one would just appear in front of me right now! Game of Thrones is awesome! But, I agree with the family tree thing. I'm always like "wait, who is he? what is he doing?" The books are harder to follow (in my opinion) because its harder to put a face to all the names. I only know about the Hatfields and McCoys because of my last name! Older people would always bring it up. 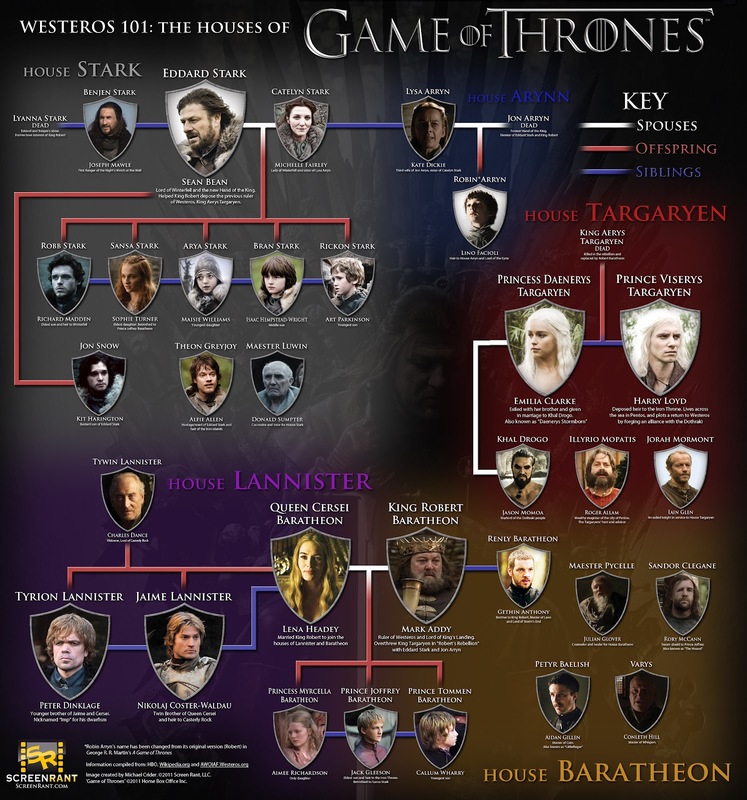 I love Game of Thrones, but you have to pay close attention to realize who really dies. Some of them I can't even tell apart once the action begins. My husband forced me to watch the Hatfields and McCoys special on the history channel a few weeks ago & I'm glad he did. That whole story was pretty damn interesting. Also, I really like the name Devil Anse now. Oh my gosh, I'm addicted to GoT! You know I'm actually tempted to print out that poster just so I know who's who when I start reading the book. I've gotten used to recognizing the actors face, not the character haha. I'm having a giveaway over at mine, you should come check it out!